Birla Industrial and Technological Museum BITM Recruitment 2018-19 (Ministry of Culture, Government Jobs in India) notification for 03 exhibition assistant posts. All legible and interested candidates can apply on or before (10-03-2018). 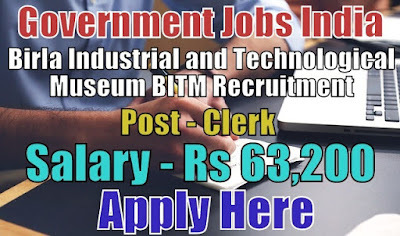 Further information about the Birla Industrial and Technological Museum BITM recruitment exams, vacancies, salary details, BITM careers, application fee, BITM government jobs in India, educational qualifications and all other details/information about this post is mentioned in details below. 1. Lower Division Clerk - 03. Age Limit - For BITM recruitment, candidate age should lie between 18 - 30 years. To know more about age details as post wise, click on the detailed advertisement. Selection Method - For recruitment in the Birla Industrial and Technological Museum, the candidate will be selected on the basis of their performance in the aptitude test, typing test and then personal interview. Candidates must be prepared for these tests. Work Experience - No further work experience required for this post.Fresher candidates and candidates with no experience can also apply for this recruitment.